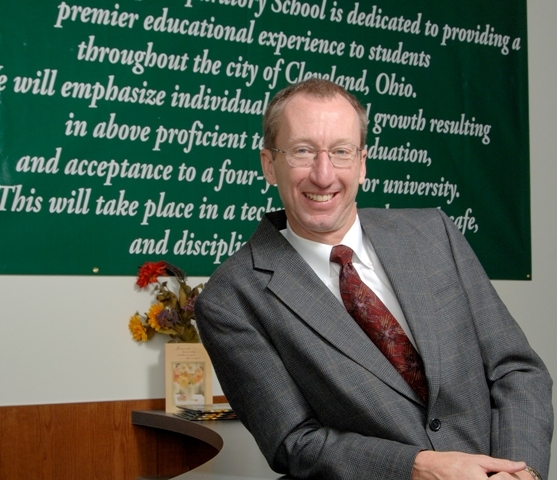 CLEVELAND – The Cleveland Foundation today honored John Zitzner, president of Friends of Breakthrough Schools, with its 2015 Homer C. Wadsworth Award. The award is given annually to a local leader who has demonstrated creativity, innovation, ingenuity, risk-taking and good humor in a civic, volunteer, nonprofit or public sector role. Zitzner received the award at the Cleveland Foundation’s Annual Meeting presented by KeyBank. Today, Breakthrough Schools operates 10 schools serving 3,100 scholars, and will soon grow to 11 schools serving 3,500 scholars in the 2015-2016 school year. Breakthrough educates an underserved student population in Cleveland that is 97 percent minority and 83 percent low income. They are among the top rated charter networks in the state. The aspirational goal of the network is to have 20 schools by 2020 serving 7,000 K-8 scholars. A successful entrepreneur, Zitzner is the founder and former president and CEO of Bradley Company, a Cleveland-based software firm that began in 1983 and was acquired by Xerox Corporation in 1998. He went on to found E CITY (Entrepreneurship: Connecting, Inspiring, and Teaching Youth), a nonprofit organization that provided entrepreneurship education to Cleveland high school students. John is a graduate of Wittenberg University and has studied nonprofit organizational management at Case Western Reserve University’s Mandel School. An Elder at Fairmount Presbyterian Church, John and his wife, Peg, have two sons, both of whom are successful entrepreneurs, three grandsons and a granddaughter. Homer C. Wadsworth was executive director of the Cleveland Foundation from 1974 to 1983. He was known as a man of creativity, courage, commitment and innovation. Prior to his death in 1994, Wadsworth’s friends and family established the Homer C. Wadsworth Award to identify and honor those in the community who best reflect those qualities.